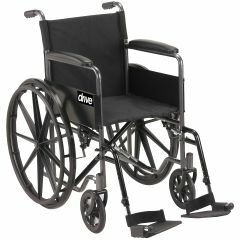 The Drive Medical Silver Sport Wheelchair comes with swing away footrest and fixed full armrest. The upholstery is made out of nylon and is durable, lightweight, attractive and easy to clean. Comes with push to lock brakes and carry pocket on backrest provides additional convenience. Comes with swing-away footrests with tool free adjustable length front riggings. Should have done this months ago. Easy to Maneuver. Safe. Compact. Lightweight. Easy To Store. Well Constructed. Comfortable. Because of excessive pain when walking any distance, I was more or less housebound. Making the decision to buy this wheelchair has changed my life in just 10 days. The motorized scooter is too bulky and heavy to put in the car. The wheelchair is a dream! Light weight and compact. I now am able to go to store with my husband and just get out of the house if nothing more than to go window shopping or to flea markets. My Doctor said it's the smartest thing I've done in a year. Sport wheelchair ...would buy it again! Compact. Easy to Maneuver. Easy To Store. Well Constructed. Safe. Lightweight. Supports Weight. Easy To Use. Comfortable. Travel. Short Trips. Daily Use. Indoors. Long Trips. Outdoors. Short Distances. Getting around the house. Light shopping. Compact. Comfortable. Easy to Maneuver. Easy To Store. Well Constructed. Safe. Lightweight. Travel. Short Trips. Daily Use. Long Trips. Easy to Maneuver. Well Constructed. Supports Weight. Safe. Travel. Daily Use. Indoors. Short Distances. Much better quality than the one bought earlier. Lightweight. Stores Easily. Easy To Use. Well Constructed. Safe. Supports Weight. Use when traveling. Good to use on tours. do you have adjustable legs (incline) for the Breezy 503 wheelchair? Is this wheelchair manufactured in the United States? Also, does an American company own the business where it is made?? Does the chair fold up?Thanks. Does this fit easily in the trunk of a standard car, ie Toyota Corolla?